Looking at space dust; extending the microscope; 5G RF chips. The first analysis of space dust, collected by a special collector onboard NASA’s Stardust mission and sent back to Earth for study in 2006, is more complex in composition and structure than previously thought. Researchers examined the dust using synchrotron light sources from three groups–the U.S. Department of Energy’s Argonne National Laboratory, Lawrence Berkeley, and Brookhaven National Laboratories. 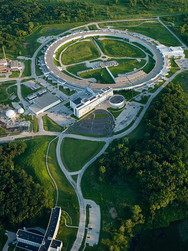 The Advanced Photon Source (APS) at the U.S. Department of Energy’s Argonne National Lab helped researchers create a map of the locations and abundances of the different elements in each particle. The APS performed elemental imaging and analysis on the small particles at just 500nm or less across. Researchers used the scanning transmission x-ray and Fourier transform infrared microscopes from the Advanced Light Source, which is located at Lawrence Berkeley. The X-ray microscope from Berkeley ruled out tens of interstellar dust candidates because they contained aluminum. These materials are not found in space and were possibly knocked off the NASA spacecraft and embedded in the aerogel. In total, however, researchers found and analyzed a total of seven grains of possible interstellar dust. Two of larger dust particles have a fluffy composition, according to researchers. They also contain a crystalline material called olivine, a mineral made of magnesium, iron, and silicon, according to researchers. Three of the particles contain sulfur compounds, which some astronomers believe should not occur in interstellar dust particles. “The highest priority is to measure relative abundance of three stable isotopes of oxygen,” said Andrew Westphal, a physicist at the University of California within Berkeley’s Space Sciences Laboratory, on Argonne’s Web site. The isotope analysis could help confirm that the dust originated outside the solar system, according to Westphal. The National Institute of Standards and Technology (NIST) has developed a new technology, which will enable optical microscopes to measure at nanometer-scale resolutions in 3D. NIST’s technology, dubbed Through-focus Scanning Optical Microscopy (TSOM), can detect tiny differences in 3D shapes, revealing variations of less than 1nm in size among objects less than 50nm across. This is far below the resolution limit for optical microscopy, which is about 250nm for green light. TSOM has several advantages over today’s technologies. For example, scanning-probe microscopes (SPMs) can perform measurements in 3D, but the systems are expensive, according to NIST. Another technology, scanning electron microscopes (SEMs), are limited in terms of 3D imaging capabilities, according to the agency. In addition, optical microscopy techniques, such as coherence scanning interferometry (CSI) and confocal microscopy, also have their limitations, according to NIST. In contrast, TSOM makes use of the information contained within the through-focus, 4D-based optical data. Unlike confocal microscopy, out-of-focus optical data is not rejected. In this method, a TSOM image is first constructed as a 3D slice. This is actually a 2D plane filled with optical data. The initial results show that TSOM-determined, cross-sectional shape differences of 30nm to 40nm wide lines agree with critical-dimension atomic force microscope measurements. The TSOM method showed a linewidth uncertainty of 1.22 nm (k = 2). A group of telecommunications operators, companies, research centers and universities have formed a new consortium to develop RF technologies for 5th generation cellular networks. The 15-member consortium, dubbed MiWaveS (Millimeter-Wave Small Cell Access and Backhauling), is a European collaborative project that will develop a new class of millimeter-wave (mmW) radio technologies. Global mobile data traffic is expected to increase by orders of magnitude in the next decade. But mobile networks face a number of challenges, such as the scarcity of spectrum resources below 6-GHz. This, in turn, could lead to high interference levels and other issues. The MiWaveS consortium is expected to have a major impact on the key enabling technologies for next-generation, heterogeneous wireless networks. “The flexible spectrum usage of the mmW frequency bands at 60-GHz and 71- to 86-GHz will enable data transmissions up to 10 Gbps for backhaul and 5 Gbps for mobile users access,” said Laurent Dussopt, MiWaveS project manager and Leti research engineer, on the consortium’s Web site. The MiWaveS project is partially funded by the European Commission’s Seventh Framework Program (FP7), within the Work Programme for Information and Communication Technologies. The members of the group include CEA-Leti, Telecom Italia, Orange, Nokia, Intel, National Instruments, STMicroelectronics, Sivers IMA, Optiprint, VTT, Technische Universität Dresden, Tecnologias Servicios Telematicos y Systemas, University of Rennes and University of Surrey.